Well, normally that is. This month, due to a mix up at the email sorting office, I’ve been wired a rather interesting and semi-famous fossil fish. You’ll probably instantly recognise it from the photo below. It’s going to be hard to play this one down, this one has been featured on stamps. I know, I’m going to get letters for highering standards. First up, let’s take a look a this month’s fish which as well as being a celebrity is also A LOOKER. If you’re prone to swooning, I suggest you s-l-o-w-l-y scroll down and ease yourself into the visual feast. LDUCZ-V956 Pterichthyodes. Once again, I’m keen to point out that I didn’t take the photos for this one. Fortunately we have a scale bar but I’m not too sure about the flashy background. It’s hard enough for this fossil to standout without the lovely yellow white combo stealing the limelight. Artist’s reconstruction of the underside of LDUCZ-V956 Pterichthyoides by a highly-skilled-looks-younger-than-he-actually-is palaeo artist, who is available for commissions and fanart at competitive and reasonable prices. 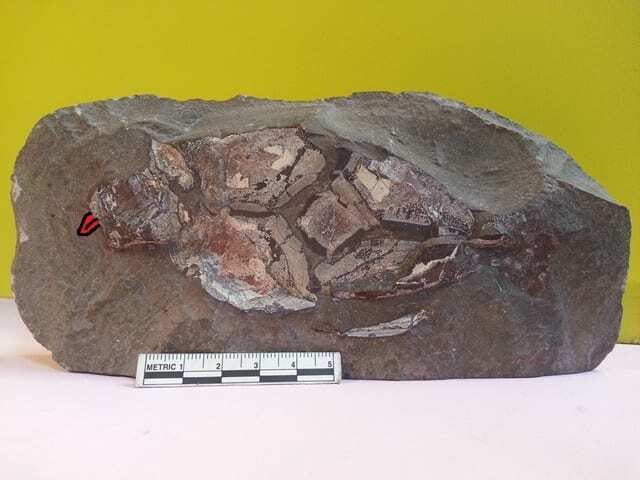 According to the documentation for this specimen, this is a fossil of Pterichthyodes which I’ve had to check the spelling of every time I’ve written in it this blog. Pterichthyodes is a genus of antiarch placoderm fish, which isn’t a comment on how this group of fish view the monarchy, but is an extinct group of heavily armoured fish. Antiarch fishes like Pterichchthchthchthyodes are characterised by bony armour that covers all but the tail making these fish look a little like aquatic armoured personnel carrier tanks, complete with comedy little eye slits at the front. Pterichthyodes and relatives had bony fins, which in some species, had an ‘elbow’ articulation which is thought to help these fish navigate the bottom of the sea. 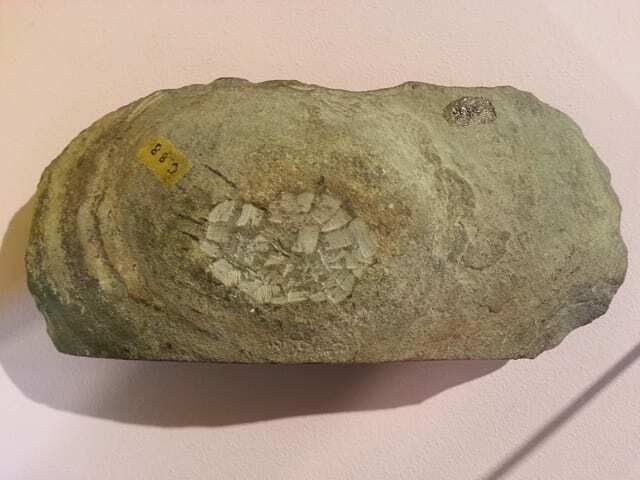 Preservation Well preserved specimens of Terryiktyodes are known from the Middle Devonian (390 million years ago) of Scotland and the label for this specimen notes that it was collected from Lethen Bar in Nairnshire, Scotland. Because Terriktheeodeeze have a lot of bony armour, which improves the chances of preservation, many near complete specimens are represented in museum collections. The plates of this specimen is very well preserved so much so that the we can tell from shape of the bony plates we can see above, that this is looking at the ventral surface of a fish (the belly). This specimen appears to have been preserved in a nodule and from hammer marks on the reverse of this specimen (confusingly, what might be the top side of the fish) I’d like to speculate that somebody may have been investigating if the top surface of the fish is preserved here too and then given up. Reverse of LDUCZ-V956 showing determined geologist trace fossils. Geovandalism? Geo-Art? Geoboredom? Research Because Pterikkyodeese fossils were found and described in the 1840s, they have been well researched in the early fossil fish literature. All placoderm fish were of interest in the 19th Century, as it’s in these groups that the earliest distinct jaw was known (although the jaw functions differently to ours in that there weren’t discrete teeth). The antiarch fish in paticular were of interest as their fins with articulation points led to reconstructions of these fish being able to venture onto land, and would have been the first animals with a backbone to do so, resulting in this beautiful reconstruction of a Pterichthyodes pensively contemplating a sunset. More recent analyses suggest that these fish didn’t use their jointed fins for contemplating sunsets but are instead adapted for life at the bottom of the ocean, so may have used their fins for digging or foraging. In Society The fossil fish in this series, haven’t often made much of an impact in society. Although not as well known as the A-listers of the fossil fish world, fish like Megalodon, which normal people may have a chance of having heard of, Pterichthyodes does have a straight-to-DVD level of celebrity. Pterichthyodes appears on stamps, in palaeo art and is often found in museums, including a very widely collected series of Devonian fish plaster models (the Grant Museum has two Pterichthyodes models on display). However, earlier this year, Pterichthyodes was briefly propelled into the limelight on a presumably extremely slow news day in April. Enterprising colleagues at Scotland’s Inverness Museum and Art Gallery suggested, tongue poking through their cheeks, that Pterichthyodes probably lived in environments similar to a certain Loch Ness. 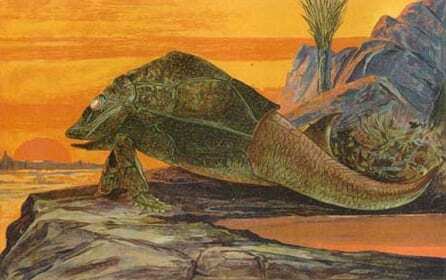 Cue, nonsensical news story of Pterichthyodes possibly being the ancestor of the Loch Ness Monster. One website went as far as to suggest the nickname ‘Plessie’, a name that gained absolutely no traction whatsoever. * I jest of course, the Pie Awards are in March and it’s minced rather than mince pies that are judged of their pieness quality. I’ve just come back to these UFFoTM posts after a long period of not reading about Underwhelming Fossil Fish (cold turkey? cold Mioplosus?). The artist’s reconstruction is to blame as I laughed so much that I fell off the wagon. Or raft.